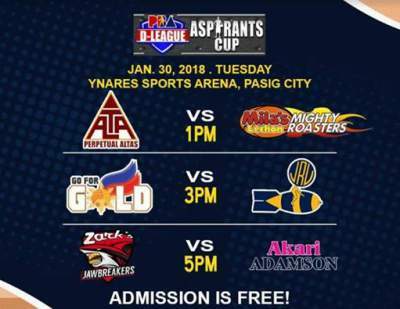 Here is the details for Zark's Burger Jawbreakers - Lyceum vs. Akari - Adamson Falcons in the elimination round of 2018 PBA D-League Aspirant's Cup. ZARK'S BURGER-LYCEUM 83 -- Perez 20, Jc. Marcelino 19, Tansingco 17, Ayaay 8, Nzeusseu 6, Jv. Marcelino 5, Baltazar 2, Caduyac 2, Iba?ez 2, Serrano 2, Cinco 0, Marata 0, Santos 0. AKARI-ADAMSON 76 -- Sarr 17, Ahanmisi 15, Espeleta 11, Manganti 9, Mojica 8, Lojera 7, Hill 3, Macion 3, Lastimosa 2, Longalong 1, Bernardo 0, Buenaventura 0, Camacho 0.